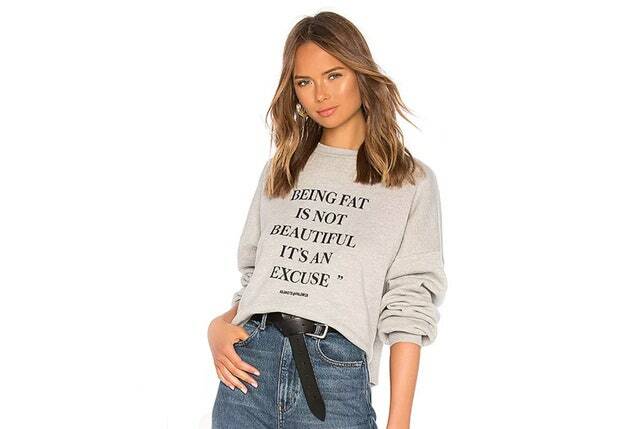 Online retailer Revolve recently received massive backlash after releasing sweaters from fashion brand LPA with a quote that read "Being fat isn't beautiful, it's an excuse". Underneath the quote, it read in tiny letters "as said to @palomija", as this negative statement was made to the plus size model Paloma Elessener by a social media troll. The whole point behind the unfortunate garment was to reclaim the fat shaming message and as a result, empower women who might relate to these type of comments being made in regards to their appearance. It is safe to say that point was completely lost since, first of all, the additional line saying that is was said to Paloma Elessener is barely legible, and second, the model wearing the sweater is anything but plus size. Basically, it comes across just as mean and negative as the original comment posted on Elessener's Instagram, an attack on women who are not skinny. The sweaters have been taken down from Revolve's website since, and the garment was rated 1.2 stars out of 5 by customers. People were leaving comments saying that they found the sweater absolutely horrendous and insulting and that this sweater was clearly sending out an extremely toxic and negative message to all women. The fashion brand behind the unfortunate garments is LPA, and they were the ones asking Revolve to take the sweaters down. The clothing brand had created the sweaters in collaboration with five women, who picked the worst trolling message they had received. The point was to highlight how awful trolling is on a personal level, and how big of a problem it is for the whole society, and the proceeds of the sweaters that retailed at $168 was supposed to go to charitable causes. Clearly, this message was completely lost in the process. It is worth noting that the sweater, as horrible as it turned out to be, was created with something entirely positive in mind. Both LPA and Paloma Elessener are devastated over how this charitable project turned out. What was meant as a body-positive message, taking back power from internet trolls, ended up looking like a fatphobic insult.